In order to consolidate their position as leaders of Yorkshire League 4 'Ensians knew they had to be at their best in their last game before Christmas against 2nd equal on points Halifax .Unfortunately the Halifax team were delayed due to their bus being literally stuck in a tiny village due to the driver slavishly following his Sat Nav .However play commenced only 10 minutes late. In the first half 'Ensians were playing against an almost gale force wind blowing down the field ,but for the first 10 minutes they played sensibly keeping possession for long periods and playing in the Halifax 22 for much of the time. Then Halifax attacked into the home half but good defence kept them at bay. 'Ensians were gaining good possession from the lineouts with Jack Smith, Sam Featherstone and Steve Wade prominent, and worked their way back up the pitch into the teeth of the wind .Declan Jackson and Luke Cowdell were giving the Halifax defence a testing time, and Rob Lofthouse had outflanked the cover and was racing for the corner only to be recalled for a forward pass. 'Ensians had remarkably spent all but 5 minutes of the first half in Halifax territory and in the last 10 minutes the heavy Halifax pack tired a little and the home team took a scrum against the head having earlier been struggling in the set pieces. The home crowd were congratulating their team for such a sterling effort when with the last move of the half Luke Cowdell put the icing on the cake by breaking through and outpacing the Halifax defence to score a try converted by Ben Hatton to make a half time score of 7 points to nil. Now playing with the wind 'Ensians continued to control the game and after 3 minutes Ben Hatton kicked a great penalty goal from 40 metres to make the score 10-nil. The home team now had their tails up, Lee O'Donnell crashed through the Halifax defence to make valuable yardage and after 12 minutes Ieuen Cranswick made a break which almost resulted in Declan Jackson scoring. 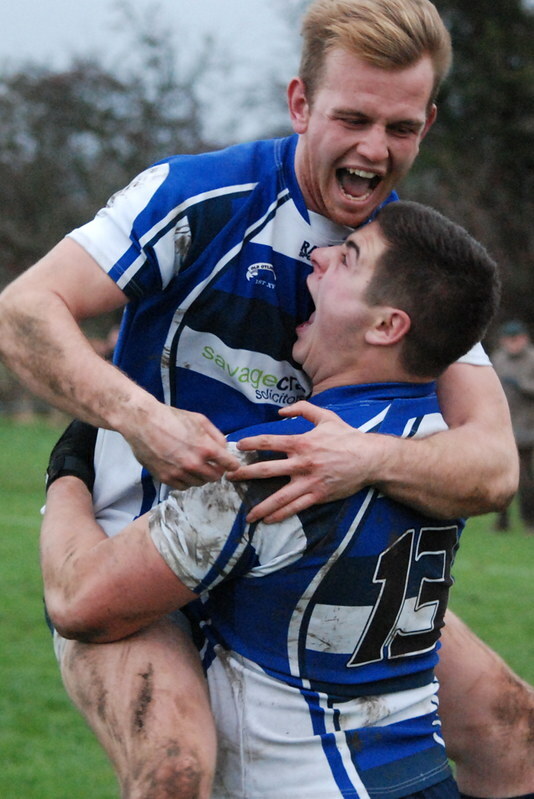 However when Halifax were penalised 40 metres out Ben Hatton kicked another superb penalty making the score 13-nil. Halifax counter attacked but two copybook tackles by Luke Freer kept them at bay. Captain Ieuan Cranswick made another quick break down the blind side passed to Ben Hatton who in turn passed to Declan Jackson who raced over for an excellent try converted by Ben Hatton [score 20-nil].Halifax moved the ball into the Home 22 but 'Ensians were using the wind intelligently and on one occasion man of the match Ben Hatton kicked 70 metres to take play into the Halifax 22 and on another Luke Freer used the wind to similar effect. This took the stuffing out of Halifax and in the last 10 minutes they tired and 'Ensians scored 2 super tries one by Declan Jackson and the other by Luke Cowdell both converted by Ben Hatton to make a final score of 34 points to nil to give 'Ensians a bonus point win.